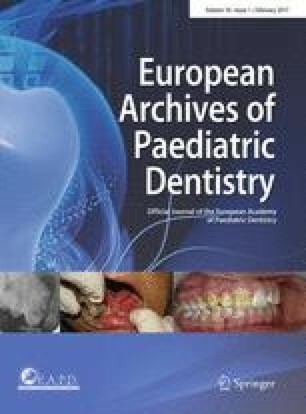 AIM: The aim of this study was to compare the care patterns of paediatric dentists and general dentists in the dental treatment of children in the Netherlands. STUDY DESIGN AND METHODS: A case control study was completed based on the financial records of one of the largest Dutch health insurance companies. After medical ethical approval the dental records from 2004, 2005 and 2006 of 16 paediatric dentists were used and compared with the records of general practitioners with the same number of insured paediatric patients from the same age and urbanisation level. Preventive, diagnostic and restorative care for four consecutive age groups (<6, 6–8, 9–11, 12–17 yrs) were used as independent variables. Differences between the dentists and the age groups were tested with the Independent-Sample t-Test and ratios were calculated. RESULTS: Compared with general dentists, paediatric dentists use statistically significant more often rubber-dam (p=0.009) and did more preventive treatments (p<0.001) in children up to aged 11 yrs, more extractions (p<0.001), took more radiographs (p=0.027) and used local analgesia more often (p=0.002) in children until aged 8 yrs and performed more restorations (p=0.02) in children up to 6yrs of age. There was no significant difference in the care pattern of the dentists for the oldest age group (12–17yrs). The care-index for paediatric dentists and general dentists from this research was comparable with Dutch epidemiological studies. CONCLUSION: Compared with general dentists, paediatric dentists have a more extensive treatment approach when treating children. In the youngest age groups the differences are the most pronounced. Further studies are needed to clarify whether the cause is the needs of the patient or an attitude of supervised neglect by the general dentists.